Find luxury, comfort and convenience at Camden Foothills, located in the heart of Scottsdale, Arizona. The one, two and three bedroom DC Ranch apartment homes feature chef-inspired kitchens, quartz countertops, stainless steel appliances, walk-in closets, and washers and dryers set in open-concept floor plans with mountain views. Additional features include pendant lighting, ceiling fans, 9-foot ceilings, garages with direct access to the home and more. Our DC Ranch apartments put you within walking distance of popular restaurants and retail stores at DC Ranch Crossing. Easy access to the 101 Freeway puts you just a few miles from shopping and dining at Desert Ridge Marketplace and all of the neighborhoods hottest destinations. And, nearby McDowell Mountain Regional Park has over 33 miles of walking, biking and hiking trails. Enjoy amenities with a balance of fun, fitness and relaxation at Camden Foothills. Start a healthy routine with 24 x 7 access to the fitness center with cardio equipment, free weights, and towel service. Entertain friends year-round at the heated pool and spa, cook and dine outside with BBQ grilling stations and escape from everyday stress in one of our poolside cabanas. When you need a space other than your home to entertain, the resident lounge inside the clubhouse has a fully-equipped kitchen, plenty of comfortable seating and complimentary WiFi. We want our resident's pets to love where they live too! Our pet-friendly community has beautifully manicured walking paths with pet stations throughout and a private off-leash dog park when they need time to run. Included in monthly rent is a technology package with savings of up to 50% off retail. This package includes Cox high-speed internet at speeds up to 100 Mbps and over 280 digital channels including over 100 HD channels and HBO. 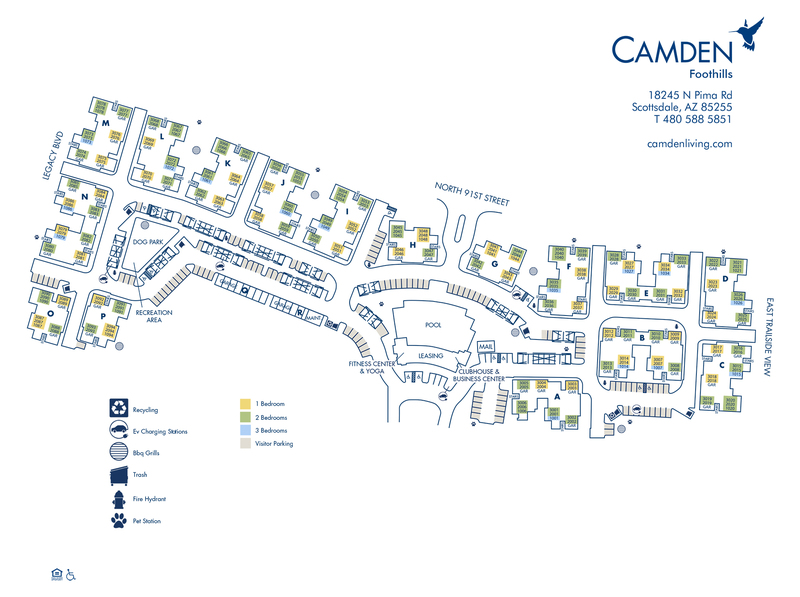 Come home to Camden Foothills and experience the balanced lifestyle you've been looking for. Call us today for more details! We'll save a spot for you! We offer one parking space per apartment home. All additional parking for residents and visitors is uncovered and on a first-come, first-served basis. Some apartment homes include carports or garages. Additional garages are available for $125 per month.